Shipping Info - Leber Jeweler Inc. Many Earthwise Jewelry® items can be shipped within 24 hours, however most are handmade to order and require longer for fabrication. Made-to-order items typically ship in one to three weeks. Custom designed orders typically take slightly longer, depending upon the complexity of the piece. Please let us know if there is a date you are targeting, as rush orders can most often be accommodated. 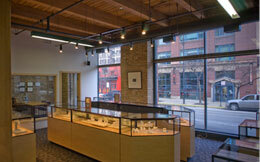 We make every Earthwise Jewelry® piece in our Chicago workshop so we can meet most any deadline. While we make every attempt to meet request dates, complications due to unforeseen factors can occur, so we encourage you to allow plenty of lead time. We provide complimentary shipping via UPS Next Day Air so packages typically take one business day for arrival. Weather and other external factors may delay a package’s delivery, so planning ahead is advised. If you have special shipping needs, such as hold for pickup or preferred shipment on a certain date, please contact us and we will do our best to accommodate.